The World’s Tallest Water Sphere has had some site formatting updates. The site now has a default width of 960 over the older, narrower 760 pixels. 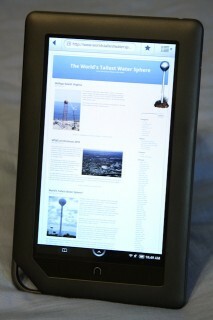 The site has been validated with several mobile and tablet devices, such as the Nook shown here. Let us know if your device or browser has trouble reading the site, and we will fix it. This entry was posted on Sunday, April 24th, 2011 at 12:20 pm	and is filed under Editorial. You can follow any responses to this entry through the RSS 2.0 feed. Both comments and pings are currently closed.